Splicer Vandals are Fallen Vandals warped and twisted by SIVA. They are armed with Solar versions of Wire Rifles and Shock Rifles modified by the technovirus, which fire red-colored blasts. Splicer Vandals have gone through significant improvements due to being infused with SIVA. For instance, their Shock Rifles no longer fire slow seeking bolts. Instead, they function more like machine guns with a much faster rate of fire and muzzle velocity. Also, their Wire Rifles now fire in bursts, inflicting much more damage than before. 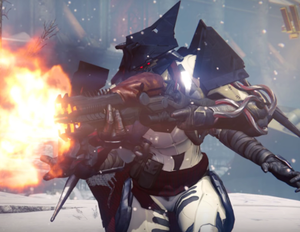 As deadly as Splicer Vandals are from range, however, it is best not to press them into engaging in melee combat, for that if they are near-death, they will regenerate health at a very rapid rate and charge down Guardians to land a powerful melee attack, much like Hive Knights and Ogres. Therefore, it is best to engage them with high-impact weaponry so they do not get the chance to enter berserk mode. Like all Devil Splicers when killed with a head shot they will occasionally shoot out a homing SIVA swarm called a Splicer Seeker at the nearest hostile. A Splicer Vandal with a Splicer Captain.